Tables in AutoCAD LT have been greatly improved since their introduction in LT 2006, with every version incorporating more and more features. One helpful feature is the AutoFill grip. The image below shows the four familiar dark blue resizing grips as well as the light blue AutoFill grip. Once you have cells selected you can left-click on the AutoFill grip to increment or copy the data in the cell to adjacent cells. (You can specify which method to use with options in the right-click menu available inside AutoFill. In other words, left-click to start AutoFill, then right-click to see the options.) The grip tooltip says "click and drag", but remember that those are two separate actions. You don't have to keep holding the mouse button down. If you only select one cell, as shown above, the increment value is 1. If you want a different increment value, all you need to do is fill in the second value in your series, select both cells, and LT does the rest. Bonus Tip: AutoFill works with dates as well as numbers. Set the Data Type to "Angle"
Set the Format to "Surveyor's Units"
Now autofill a few cells and take a look at the results. Interesting. 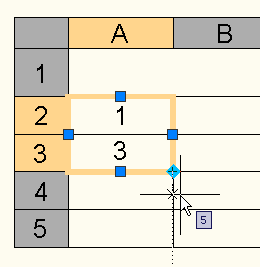 When the data type is set to "Angle", the increment value appears to be one radian, regardless of the cell's format. 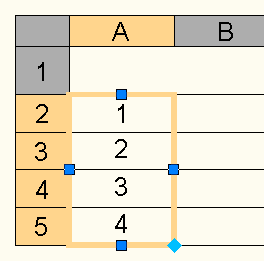 A workaround would be to input the second value in the series as described in the second half of the original post.